Homeschooling with Five in a Row? We've been enjoying this literature based home school curriculum and have enjoyed rowing books from all three volumes. Who knew there was so much to learn with just one book!! 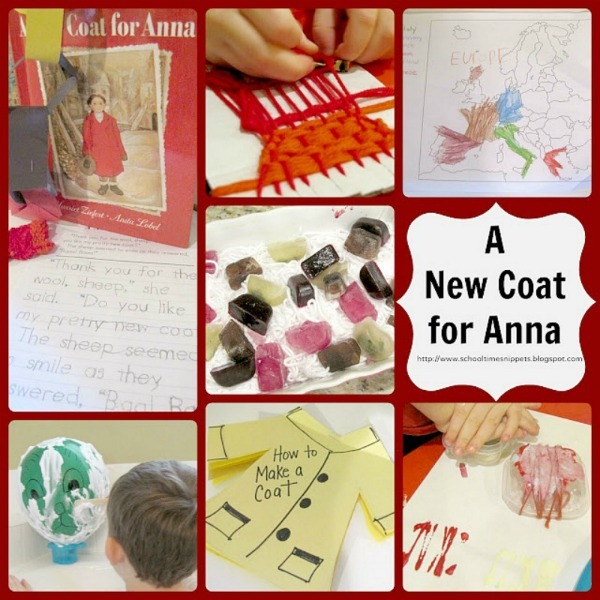 Today I am detailing our activities during our row of A New Coat for Anna. 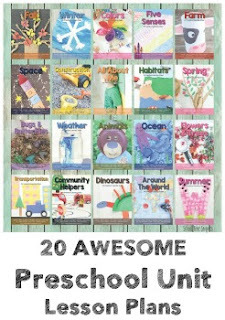 I hope you will be inspired to plan your next row using this book and some of our activities!! A New Coat for Anna by Harriet Ziefert is a beautiful story of a mother's love and sacrifice to get her daughter a new coat. From the cover and first illustration in the book, readers become aware that their town recently went through a time of war. A war just ended and the stores have remained empty. 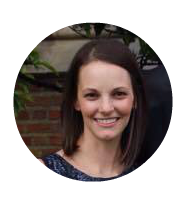 Anna's mother comes up with an idea to trade her valuables for items needed to make Anna a new coat. In the story we visit the sheep farmer, a spinner, a weaver, and the tailor-- all the people involved in making Anna's new coat. The book didn't give a specific location of the story, but because the mention of "war" we decided to focus our Geography lesson on Germany and added the flag of Germany to our garland. We also labeled several other countries we have talked about in the past. We did several "Do this for me, and I'll give you...." this week ; ) We also read a version of Jack & the Beanstalk , which then led us into a conversation of the Grimm Brothers, who are from Germany, and Fairy Tales! It is jam-packed with resources!! There is a ton of information in the unit study, but one thing it had us do was to translate some words and we did so using Google Translation; T LOVED typing in all sorts of words! "How to Make a Coat" booklet. We had no more red construction paper, so a yellow coat had to do! I printed clip art of a sheep, spinning wheel, cooking pot, weaving pattern, and a tailor and had T put it in the correct order. We also did the 'Memory & Comprehension' lesson from the manual, but I will spare you the Q & A-- it's quite long! We made fingerprint 'inchworms' then T used his ruler to measure them. We also pulled out our Inchimals and measured several things around the room and built a few towers! This was an added math lesson after we had read the book several times and it mentions the tailor hung her new coat with 6 buttons, 3 on each side, in the window. So we grabbed some buttons and went to 36! I found several activities that involved the art of weaving online and Big Brother made the final decision of what one he would like to follow. He used the weaving loom tutorial from HomeSpun Threads. He did really well at this task! In the end, we decided to put his final product in Little Sis's doll house as a rug! 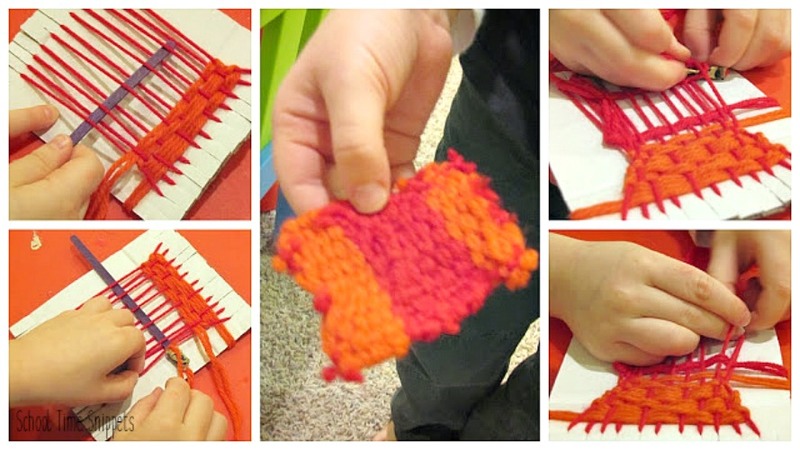 Just grab some yarn and wrap it around a block or tupperware container, like we did. Secure with tape, dip it into paint, and press onto your paper. We read a non-fiction book about Sheeps, the book "Farmer Brown Shears His Sheep " and then Big Brother had his own "Shearing" fun in the bathtub!! What?! You've never seen a green-skinned sheep before?! Anna and her mother picked Ligonberries to make the deep red color for her new coat. 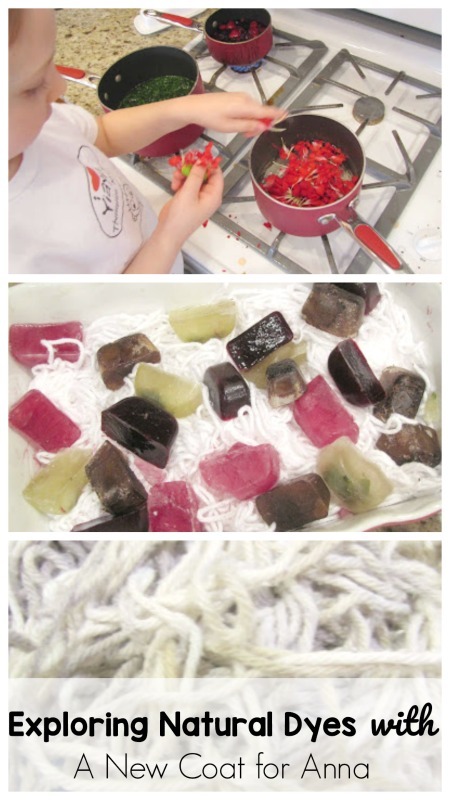 We tried our hand at making natural dyes with Spinach, berries, and carnation flowers. We had fun nonetheless!! You can see a bit of purple and brown (also used some frozen coffee cubes), but the rest of the would've been colors washed out! Sad! 2. I only soaked the yarn in vinegar and I should have done salt, too. And now this tangled up "ball" of yarn is in the closet. I tried to untangle it, but my patience ran out! I obviously should have chosen the "Hand Wash/ Wool" setting when washing it. Oh well! Hope you enjoyed our row with A New Coat for Anna! Hope this helps you plan out your own activities using A New Coat for Anna. Enjoy browsing through our Five in a Row Resource Page. Don't miss our All Time Favorite Five in a Row Lessons! Our next FIAR post will be for "Three Names." See you soon! !